KARACHI: Worker remittances, a major source of foreign currency inflows, grew 4.24% to $2.03 billion in August 2018, according to the State Bank of Pakistan (SBP) on Monday. The growth in remittances may be attributed to a significant recovery in international crude oil prices and rupee depreciation. Brent crude oil price recovered around 45% to $77.5 per barrel in the last one year and a majority of overseas Pakistanis reside in oil producing and exporting countries in the Gulf. Besides, a much larger depreciation of around 18% in the rupee’s value against the US dollar to Rs124.24 in the last nine months may have led overseas Pakistanis to send remittances through proper banking channels. 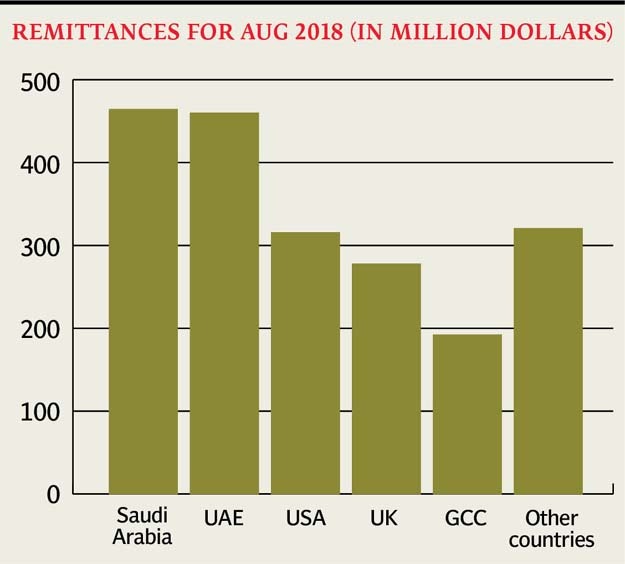 The growth in remittances remains a strong desire of the government to stabilise rapidly depleting foreign currency reserves, which dropped to a critical level of around one-and-a-half-month of import cover at $9.88 billion on August 31, 2018. The federal government is considering multiple options to stabilise the reserves including restricting the import of certain items like cars and mobile phones. Besides, it is yet to decide whether to seek an International Monetary Fund (IMF) bailout or revert back to short-term borrowing from friendly countries and debt markets. In August 2018, the inflow of worker remittances amounted to $2.03 billion, which was 4.24% higher than August 2017 and 5.60% higher than July 2018, the central bank said. Cumulatively, in first two months (July-August) of the current fiscal year 2019, overseas Pakistanis remitted $3.96 billion, a growth of 13.45% compared with $3.49 billion received in the same period of preceding year. Country-wise details for August 2018 showed that inflows from Saudi Arabia amounted to $465.53 million compared to $511.28 million in August 2017. From the UAE, $461.2 million was received in remittances in the month compared to $440.38 million, from the US $316.89 million versus $260.34 million, the UK $278.84 million against $249.14 million, GCC countries (including Bahrain, Kuwait, Qatar and Oman) $193.17 million compared to $230.22 million and EU countries $59.64 million compared to $62.75 million. Remittances received from Malaysia, Norway, Switzerland, Australia, Canada, Japan and other countries during August 2018 amounted to $262.06 million against $200.35 million in August 2017, according to the central bank.